Country Lock and Key INC. are available 24 hours a day, 365 days a year. Each of our technicians are licensed, bonded, and insured to give you, the customer, and peace of mind when we come out to service your vehicle. Before the trouble begins, stop by one of our convenient locations to have your vehicle serviced. Sticky locks, doors not working, or having duplicate keys made or repaired can keep you out of the cold or rain when you are in a hurry to be somewhere. Being locked out never happens at a convenient time and we want to be sure you are supplied with quality locks, keys, and accessories for the locking system on your car. Be sure to have extra keys made for your high security vehicle, as lost keys are the most expensive on these vehicles. Looking to have a keyless entry remote made for your car, truck, or SUV? Country Lock and Key can supply and program a remote for any vehicle that has been factory equipped with a remote unlocking system. 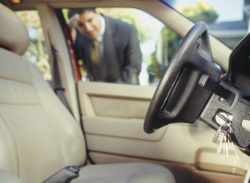 A damaged or lost key can be fixed by cutting a new key off of the VIN number of the vehicle or a factory code. Call and talk to one of our technicians about which vehicles Country Lock and Key are able to cut keys by code for.